Love without free will? Not possible. Yes, forced love is NOT love! Was just thinking about this - the very fact that God is sovereign AND He actually hates the very sins He nonetheless has chosen to allow us the freedom to commit (but for a limited period) - that's a huge nail in the Calvinist narrative - which is, "God is Sovereign, man has no choice but to sin," because "those not of the elect are incapable of choosing God or doing anything but continue sinning against God." Whhaaaa??? - so, GOD trapped vast millions in the very sins He hates - especially the sin of unrepentance - which Calvinism, if true, would mean. So, the sin of unrepentance would then be GOD caused - why? Because the Calvinist says there is NO choice by man, when it comes to salvation - that God chooses who He will save - AND, what many of them often deny, is by their own theological logic, that would mean that God also doomed much of humanity to misery now and eternal punishment, later - not because of their rejecting Him (nooooo - remember, with Calvinism, there is NO choice), but because He supposedly rejects them. And they also believe God is a God of love? He'd also be a God of unimaginable hate - on a scale that would make Hitler look like an amateur - IF 5 Pt. Calvinism were true. Rather interesting, is it not, that the Apostle Paul in Acts 17 said that, "The times of ignorance God overlooked, but now he commands all people everywhere to repent..." Ah, but Calvinists insist that those non-elect CANNOT repent - per God's supposed choice of ALSO choosing the non-elect's eternal status before they were even born. Are we to think God is not fair - that He demands of "all people everywhere" repentance, when He's supposedly made most of them so as this would be impossible for them???!!! He requires obedience to something He's supposedly prevented???!!! As well, why the anger at those non-repentant, IF He has trapped them in their inability to repent? In fact, according to Five Point Calvinism, people remain unrepentant and unsaved BECAUSE THAT IS PRECISELY WHAT GOD DESIRED FOR THEM - thus He's trapped them in unrepentance without any way out / cut off any way for them to be saved. But throughout Scripture, God is angry at people who remain unrepentant - but if He insured this state for them, then His great anger is irrational. Then He's commanded something of people He's made impossible for most to do. This Calvinist teaching is unScriptural and dangerous! And who was Christ's sacrifice made for - just one group of people? NO!!! Continue to verse 6! "6 who gave himself as a ransom for ALL, which is the testimony given at the proper time." Calvinists say it is God's desire that most people remain unsaved / unrepentant. But what does the Bible say? Ezekiel 33:11: "Say to them, As I live, declares the Lord God, I have no pleasure in the death of the wicked, but that the wicked turn from his way and live..."
2 Peter 3:9: "he Lord is not slow to fulfill his promise as some count slowness, but is patient toward you, not wishing that any should perish, but that all should reach repentance." In Acts 17 and other places, the Apostle Paul was appealing to the reason and intellect of the men of Athens so as to PERSUADE them to come to faith in Christ. But Calvinism asserts that there is NO role in this decision - that God chooses us ONLY - that we play no role in making that decision - as there is no real decision for a man to receive what God offers - but only, supposedly, what God GIVES. Scripture redundantly refutes this! In Acts 10, the Roman centurion Cornelius began seeking God WAY before He was saved. Yet, was God not wooing him - OF COURSE - and God's wooing is effective upon one with an open and willing heart to listen AND RESPOND BACK to God. But for an UNWILLING man, God's wooing is ignored and avoided. God, IN HIS SOVEREIGNTY, gave man a choice of accepting or rejecting Him, and the ability to seek and respond to Him. And, finally, what portion of humanity did Jesus come to save? John 3: "16 “For God so loved the WORLD, that he gave his only Son, that WHOEVER believes in him should not perish but have eternal life. 17 For God did not send his Son into the world to condemn the world, but in order that the world might be saved through him. 18 WHOEVER believes in him is not condemned, but whoever does not believe is condemned already, because he has not believed in the name of the only Son of God. And notice, in the last underlined verse above, it gives the reason for God condemning a person - and it is NOT because HE decided for them to accept or reject Himself - NO - it indicates one's personal decision is tied to one's eternal fate. God does not FORCE a man to love Him BACK - as how could forced love truly be true love? 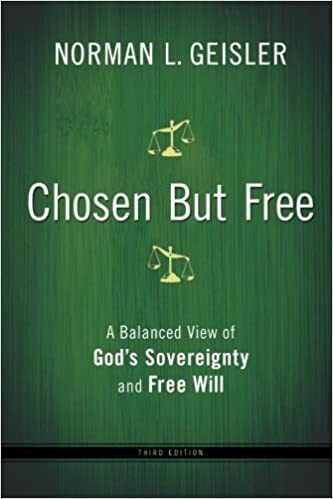 IN HIS SOVEREIGNTY, God gave man free will to make this decision (to reject or accept). Similarly, God hates sin, and yet He chose to allow it, if but for a brief span in eternity, as one day He will do away with all corruption and sin. So, God desires our love, but also allows our rejection. Do you reckon God also elects/predestines certain individuals for various tasks and so overrides free will in specific cases ? What do we make of this post Philip ? The second objection to reformed doctrines brought forth during the remonstrance had to do with election. Both sides agree that God elected those who would be saved from the foundation of the world. After all, the scriptures clearly say so. Inherent in the belief in Human Ability is the belief that God chose His elect based on the "foreknowledge" of the choice that they would make. Those who hold this view claim 1 Peter 1:2 as their prooftext. "elect according to the foreknowledge of God the Father, in sanctification of the Spirit, for obedience and sprinkling of the blood of Jesus Christ: Grace to you and peace be multiplied." However, does this scripture imply a foreknowledge of a choice, or a fore-loving of a sovereign God. To include free will in this scripture takes some creative literary gymnastics. What does the Bible say specifically about God's election? ...The Pharisees were appointed to be disobedient to the Word (1 Peter 2:8,9) (and thank God they were). The clearest statement regarding God's election is in His statement regarding Jacob and Esau in Romans 9:10-13. There is no getting around the clear message of the text. God loved Jacob and hated Esau, before they were born, before they had done any good or evil, not of their works, but so "that the purpose of God according to election might stand". Esau sought God's Covenant blessings with tears, but never received them. The scriptures are clear, God's election is not based on anything we do or will do, but is based on His will (Eph. 1:4, 5 ,11). It is unconditional. I would argue that if God was to choose between Jacob and Esau based on a foreknowledge of righteousness, He certainly would have chosen the honest, hardworking, and forgiving Esau over the lying cheating scoundral Jacob. But God chose Jacob, so the the purpose of God according to election might stand. My take is that he’s cherrypicked Scriptures to fit an unScriptural theological construct based upon the logic of men! BTW, BOTH Arminians and Calvinists make this mistake! What God predestined was that He so would save all who would be willing - WITH HIS HELP - to begin to be drawn toward loving Him BACK! And He wants to help ALL to faith, but many resist His wooing - as it’s only effective upon those with WILLING hearts and minds, just as it was with Cornelius - as he was seeking and being drawn by God WAY before he heard the Gospel and was saved - a direct example rebutting Calvinists’ insistance that an unsaved / “unregenerated” man cannot and will not be capable of seeking or responding to God. But Cornelius did, and his seeking was the very stated reason God honored His seeking / responding to God’s wooing him by connecting him with Peter and the Gospel - as only then did he receive the Holy Spirit! There is a lot in that verse as well as in the context of chapter 17. Trusting in St Augustine or John Calvin alone for one's strength is not wise. One can cherry pick scriptures to win a case in that manner. Again not wise. One things about these types of discussions is this: let's be civil and learn from each other. I don't see how believing in Calvinism is a salvation issue, and therefore I don't think the topic matters. The way I was saved and many have been saved has been very Calvinistic in nature, and there's more hope in Calvinism b/c even the most depraved of sinners can be elected, and it shows HOW WE HAD NOTHING TO DO WITH OUR SALVATION! Nobody can come to Christ in their own power, and to say that they can is to deny the sovereignty of God. Clay, 5-point Calvinism a) directly contradicts the Scriptures I qouted that clearly show that God has offered His salvation to "ALL" as "God did not send his Son into the world to condemn the world, but in order that the world might be saved through him" and b) if 5-point Calvinism were true, per its insistance that God desires that He only save SOME of those across time, while supposedly condemning the rest (and NOT because of anything they do or desire, but only because that is what Calvinists insist He decided FOR most of humanity, and did so BEFORE THE EARTH OR ANYONE EXISTED OR HAD SINNED) - if that were true (and the Bible clearly contradicts it! ), then God and His "GOOD News" would, in reality, be an eternal nightmare for those given no choice or decision, or even an ability to ever love or seek God/Jesus! Note that God commanded "all people everywhere" to repent." Does God expect people to obey His words OR NOT? And if He created people so they could not obey His words, then why is He angry at them for their lack of repenting and of their rejecting him - and acting as if their failure to obey His words are instead THEIR fault? Calvinism is a false doctrine of MAN'S logic that directly contradicts many Scriptures. Ok, so how does it hurt evangelism or potentially turn people against Christ? Because if people think Calvinism's teachings of a God who would choose to condemn most of the world instead of love it are TRUE, then many will reject such a God - one that would clearly be FAR more of a hater of mankind than the loving, suffering God found in Scripture. Especially per how Scripture instead says God views one man vs. any other, note: "God shows NO partiality!" (In Romans 2:11 and multiple other places). BTW, IF Calvinism is true, why is there any need for the Great Commission, IF God merely "regenerates" people to salvation? Why would it matter that THEY first hear the Gospel, as IF a person's salvation was already and long ago decided by God, then there is NO choice of faith made by a man, as the only choice would be the one God made for him in eternity past? But the Bible clearly says every person both CAN and must either choose or reject God. And yet, God has always foreknown the choice and response of every human to Him - which is a very different matter. Calvinism and Arminianism delve into important rational issues that they attempt to resolve. Unless one is a stickler for cult-like adherence to a particular denomination or system of thought, i.e., committed to their particular church, I'd expect a Christian to be on a spectrum. In my experience, the former tend to have less issues with accepting Christians who are still sinners, whereas the latter I find can run into issues with judging others and insecurities over their own sin. To spin matters the other way around, the former can lead to a depressive state of feeling helpless over our dispicable sinful nature which even babies have but God just graciously washes over with Christ, while the latter offers some practical hope with God empowering us to change for the better and will see some good in people. Again, I'd expect most are more on a spectrum. But, then, if you're attached to a church which is one way more than the other, you'll like find that you subconsciously embrace certain ways of thinking that stem from the particular system of thought it embraces -- even if you consciously know better and would say otherwise when questioned. BOTH Arminianism and Calvinism have false aspects in what they assert! The question is, IN His sovereignty, what has God made man capable of and what choice has HE given them - that He made possible but not certain for ALL persons per Jesus and the cross. Scripture teaches: It is true - NO one could believe without God first making it possible; That He wants ALL to come to faith; That He takes no pleasure in anyone remaining unsaved/perishing; That He's made ALL aware of His existence, yet many have suppressed it and have deluded themselves into denying Him; That He's given everyone a choice they can exercise (to eternally resist Him OR to begin responding to Him) - and amongst all so willing, He will guide them into salvation. That the ONLY way to salvation is through faith in Christ; That much of humanity will perish because THEY will decide to permanently reject God/Christ; That He will woo, draw and guide all who will not permanently resist Him and that His efforts are only effective upon the willing hearts and minds of those who will not permanently resist Him, who will, at some point, begin to listen, obey His prompting, and begin to obey Him. Of the things I listed above, BOTH Arminianism and Five Point Calvinism deny various aspects of - because all of them don't fit into their respective boxes of man-made logic - of which BOTH contradict some key aspects of Scripture to arrive at. If we have do not have free will ( to either choose God or reject God) then God would be a dictator God and would not be perfect and as such, would not be God. Because, while God can't make a perfect creation ( since only God is perfect), God, being God, would make a creation as close to the ultimate goal as possible and a being that has free will to decide it's fate would be superior to one that doesn't have free will and if God created a being that KNOWINGLY had no free will then God would have KNOWINGLY created a being with no chance of salvation, which would make God LESS GOOD than a God that created a being WITH free will. Not to mention Scripture says rejecting God/Christ to be a terrible sin. So, if God chose FOR any human that they could ONLY reject Him / couldn't choose to obey His commands to repent and have faith, then their rejection would be due to GOD causing their horrible sin of denying Him. Yet the Bible says God neither causes or tempts one to sin. And God choosing only misery on earth and eternal punishment afterward for a person would mean that God hates them on a level Hitler couldn't imagine. And the Bible says the hard hearts and minds of people cause their rejection of Him while asserting across Scripture that people CAN and should turn to the Lord, that He wants them to, and that anyone who will shall be saved! Yet Calvinism denies this. I think Calvinism takes the "predestined" roles that God assigns to certain people ( like Moses, Elijah, John, etc) and thinks that means that God predestines who WILL believe and thus be saved. Paul: I think Calvinism takes the "predestined" roles that God assigns to certain people ( like Moses, Elijah, John, etc) and thinks that means that God predestines who WILL believe and thus be saved. Exactly - this is Five Point Calvinism's great error - to mistakenly believe God determined which people WILL and undoubtedly believe, AND which persons will never / and CAN'T believe. God just makes belief and faith possible, but not certain, per His choices as to whom will be saved. And, of course, His omniscience means He has always perfectly known the eternal fate of each - but He didn't choose that fate Individually for anyone. But what God DID predestine is, for anyone willing to respond to His prompting, AND WITH HIS HELP, that they WILL come to belief, and that all such people who come to faith are the ONLY ones across time He will save! He rejects all permanentlt rejecting rebels! And though He desires ALL come to faith, He gave ALL a choice as to which fate they would choose, per whether they would ever desire Him, OR instead reject Him. Who will God NOT help to faith in Christ? ONLY those who desire to permanently resist and reject Him and the help He wants to provide them - so, it's a matter of, first, God's desire to save all humans, and secondly, their personal response (whether avoiding/rejecting or positively responding) to His wooing and enlightening.